The toxicology lab at the Cook County medical examiner’s office — which gained worldwide attention in 1982 for confirming that seven people were killed with cyanide-laced Extra-Strength Tylenol capsules — will virtually shut down next year, when most of its testing will be outsourced. County officials say they hope to save about $1 million over the next year and to speed up autopsy results by shipping most toxicology samples to a private company for testing. The tests — which identify chemicals in the body — help determine the cause and manner of deaths. They’re routinely done in investigations of homicides and traffic deaths. In recent years, they also have helped to document the hundreds of heroin and fentanyl deaths that have put Chicago at the center of a national opioid epidemic. In March, though, the county will eliminate 18 toxicology positions, including one that’s already vacant, and start sending out most tests. The county will retain two lab assistants to ship out samples and two toxicologists to perform simple tests for substances like carbon monoxide and alcohol. Spokeswoman Becky Schlikerman said the switch is expected to save the county about $1 million in the 2017 budget year. Testing costs will increase from about $400,000 in the past year to about $760,000 in the current year, but that difference will be offset by the layoffs, she said. The medical examiner’s office has spent nearly $1.3 million to upgrade its laboratory equipment since 2012. Now, the county is planning to sell it. The outsourcing is expected to reduce the lab’s average turnaround time for a toxicology test from about 40 days to about a week, Schlikerman said — timeliness she said is important to the police and to people waiting to learn the cause and manner of the deaths of loved ones. But some current lab employees are skeptical outsourcing will produce better results or big savings in money and time. “If Cook County were to outsource all of its toxicology testing, I can tell you right now that so many drugs and toxins will get missed in reports,” said one lab worker, who spoke only on the condition of not being named. The office’s toxicology lab already was sending out some tests. For instance, the Cook County lab can detect the presence of fentanyl and fentanyl analogs but can’t determine the quantity of the drug, which requires outside testing, according to Schlikerman. So far this year, 392 deaths in Cook County have been attributed to heroin and 366 to fentanyl, often added to heroin to boost its potency. Those figures aren’t considered current, though, because of delays of up to 90 days in completing toxicology tests. 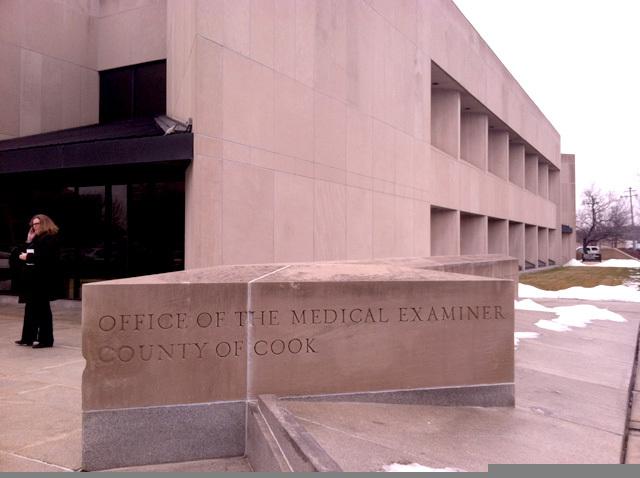 Outsourcing the tests will help the medical examiner’s office keep its recently obtained national accreditation, Schlikerman said. “According to National Association of Medical Examiners standards, 90 percent of toxicology reports need to be completed within 60 days,” she said. The office lost that accreditation in 2011. The following year, Dr. Nancy Jones resigned as chief medical examiner after leaked photos showed bodies piled up in a cooler in the West Side morgue. Dr. Stephen Cina, who succeeded Jones, won back the office’s accreditation in April. In June, Dr. Ponni Arunkumar, who’d been deputy chief medical examiner, was elevated to head the office.